Some paint brands claim to contain no or low lead levels or to be “environmentally safe.” However, there is no way for the consumer to know whether these claims are true or false. And in many cases, claims that the paint is “lead free” have been found to be false. 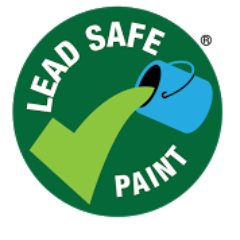 The Lead Safe Paint® program is overseen by an independent certification body and is the only lead paint certification program where analytical paint testing is conducted by an accredited laboratory that participates in the Environmental Lead Proficiency Analytical Testing (ELPAT) program. Initial analytical tests conducted on paints under brands carrying the Lead Safe Paint® logo have demonstrated that these paints contain less than 90 ppm total lead (dry weight) — the strictest lead limit for paint established by any government anywhere in the world.